Included on the Kalida High School homecourt court are, from left, senior attendants Kevin Hamburg and Kierstan Siebeneck, freshmen attendants Adam Basinger and Dayna Schimmoeller, junior attendants Josh Verhoff and Irene Jimenez Gonzalez, sophomore attendants Josh Recker and Kyla Fortman and senior attendants Jacob Kahle and Kara Siefker. Noah Hermiller and Taylor Lucke (center) were named King and Queen of the court, respectively. KALIDA — Kalida High School named its homecoming court for 2018. Noah Hermiller and Taylor Lucke were named king and queen of the court, respectively. The crowning ceremony took place Friday, Feb. 16 in the Kalida High School gym. Crowning the king and queen were last year’s Kalida royalty, Derek Buss and Hannah Kahle. 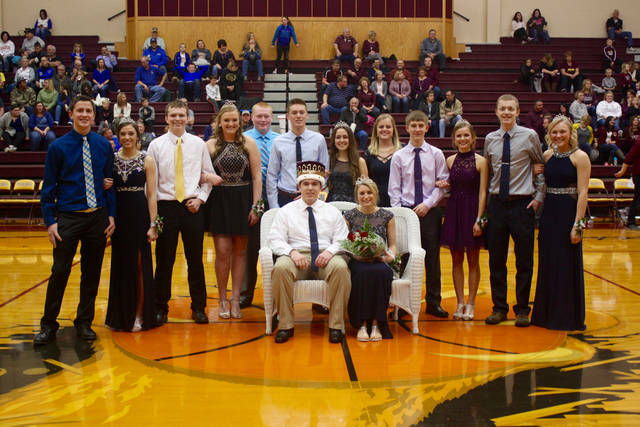 https://www.limaohio.com/wp-content/uploads/sites/54/2018/02/web1_KalidaHCCourt.jpgIncluded on the Kalida High School homecourt court are, from left, senior attendants Kevin Hamburg and Kierstan Siebeneck, freshmen attendants Adam Basinger and Dayna Schimmoeller, junior attendants Josh Verhoff and Irene Jimenez Gonzalez, sophomore attendants Josh Recker and Kyla Fortman and senior attendants Jacob Kahle and Kara Siefker. Noah Hermiller and Taylor Lucke (center) were named King and Queen of the court, respectively.